Writer David Coyle was 18 years old when he wrote Poppy as a student. After discovering the script, Director James Cunningham was determined to make it as a CGI short film. Poppy took 15 months to make. A one-day shoot occurred at Weta Digital in Wellington, NZ, (on Peter Jackson’s new Motion Capture sound stage), with some of New Zealand’s finest actors. From there, Director James Cunningham embarked on a labour of love and made the film with a tiny support crew keeping him company most of the time. He camped out in the spare room at home for most of the year and then took over a corner of an office at work, hand-crafting the film with loving detail but always focused on the story. 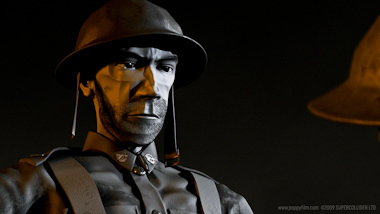 The driving ethos of the film was to create an emotive, affecting and dramatic CGI animation. The approach James took was to harness the gold that actors bring with their performance to take the CGI short genre into a new realm. Poppy is not cute, quirky or a film for young children. The Director’s last CGI short film Infection competed in competition at Cannes, Sundance and 20 other international Film Festivals. Infection is one of the most successful short films ever made in association with the New Zealand Film Commission. Wed, May 4 @ 9:30 a.m.